Anthony Joshua has 'more chance' of fighting Tyson Fury than Deontay Wilder at Wembley in April, says promoter Eddie Hearn. Negotiations for Joshua to fight WBC champion Wilder have broken down again in recent weeks, with Hearn revealing that he has not received any responses from the American's team. But Fury could have emerged as a more genuine opponent for a potentially huge world heavyweight title fight at the national stadium on April 13. "Well, to say Deontay Wilder's camp has gone quiet, that's saying it lightly," Hearn told Sky Sports News. "Probably up to six unanswered emails now. "In fact, I sent one a couple of days ago, saying I just want to check these haven't gone into your Spam items. "It is frustrating because you walk out there on the street 'When's he going to fight Deontay Wilder?' It's like, whenever they want it, but sometimes the public want to believe a fighter on Instagram all day. I've spoken to him. He knows if he wants to fight Joshua, it can happen April 13. "If they wanted the fight, they would talk to me. They're not even talking to us. We've made offers, we've made percentage splits. Everything we can do, to try and make that fight. "I think right now, there's more chance of fighting Tyson Fury. There's a man that knows he can have this fight, if he wants it. I've spoken to him. He knows if he wants to fight Joshua, it can happen April 13." Dillian Whyte and American Jarrell 'Big Baby' Miller are also on a shortlist for Joshua, who has recently returned from holiday, and Hearn hopes to conclude a deal before the end of the month. "There's Dillian Whyte, there's Jarrell Miller, but Joshua is back from holiday, he's started training now, he wants to know," said Hearn. "We've probably got 10 days to two weeks before we officially have to pull the trigger. "All those guys that I've mentioned, particularly Wilder, Fury and Whyte - that fight is there for them. "What I can tell you is, Dillian, I was with him this morning. He wants a great deal to fight Joshua. I don't blame him for that. He's been through a hard road to get where he is to No 1. "He can wait and become mandatory at some point, but if Dillian Whyte wants to fight for the world heavyweight title on April 13, there is the opportunity for him to do so, right now. 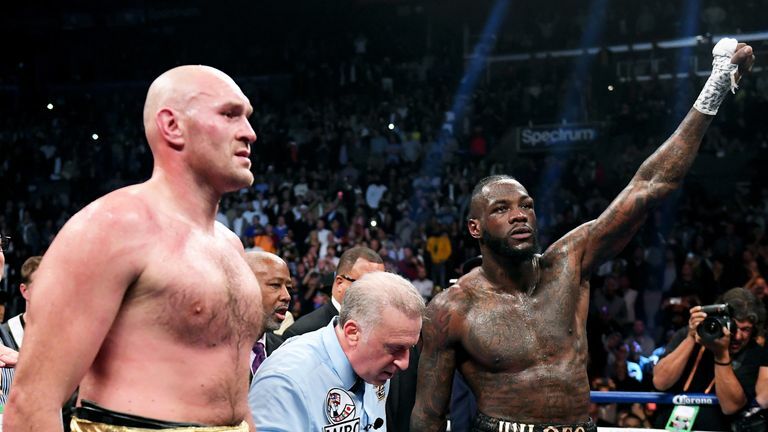 "It's almost like a race against time, particularly for those three, Wilder, Fury and Whyte. They've all had offers, they could all sign now today, and get the fight. But do they want the fight? I believe the offers, some have been made, some are about to be improved, it's put up or shut up time. "You want to win these four title belts, you believe you can beat Anthony Joshua, then let's go, but everyone wants to negotiate, and rightly so."